Light Rail For Fiji In The Future – Is it Possible? Minister of Agriculture, Rural & Maritime Development Management & Metrological Services, Inia Seruiratu (third from left) and University of the South Pacific Acting vice chancellor Derrick Armstrong with the particpants of the 2018 Pacific Islands Transport Forum at the USP Japan ICT lecture theatre on November 8, 2018. Photo: Ministry of Infrastructure & Transport. What if Fiji could be the first country in the South Pacific region to introduce light rail as a mode of transport to work in towns and cities. Yes; that’s right light rails a mode of transport for the future. Minister for Agriculture, Rural and Maritime Development and National Disaster Management and Meteorological Services, Inia Seruiratu in his capacity as the High-Level Climate Champion spoke at the official opening of the Pacific Island Transport Forum. The three day forum begun yesterday at the University of the South Pacific Japan ICT Centre, Laucala Bay Campus. Mr Seruiratu said the Fijian Government is working with the Government of India on the feasibility study in the introduction of rail transport. “Fiji is also working in collaboration with Global Green Growth Institute (GGGI) on the feasibility study on use of electric vehicles. 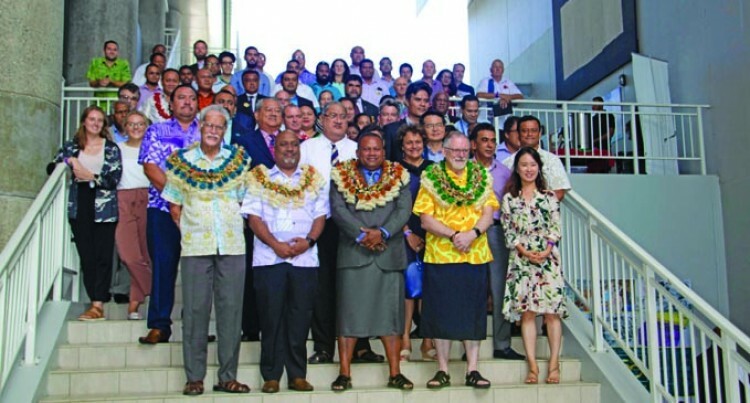 “Preliminary discussions are being currently undertaken with United Nations Economic Social Commission for Asia and Pacific (UNESCAP) in the formulation of Fiji’s Sustainable Urban Transport Index (SUTI). “This will help Fiji develop long term urban transport systems in our towns and cities. “I am looking forward to engage with our youths who are currently researching on potential solutions to our future transport challenges in the Pacific. “I urge you all to support our young researchers. It is important that we build our own capacity. Fiji has also taken the initiative to reduce its greenhouse gases. “This includes the improvement of fuel standards by reducing sulphur level to 50 part per million (ppm) in unleaded petrol and 10ppm in diesel from January 1, 2019. “Also, Government has introduced several incentives to this regard, namely; to encourage investments in Electric Vehicles (EV), Government will introduce a 55 per cent capital deduction for any purchase of EV. This incentive will be available for the next five years. “Zero fiscal and excise duty on importation of new hybrid motor vehicles, the introduction of concessionary duties on public transport and Concessionary on shipping vessel parts and paint to name a few. “Fiji has almost completed work on our Low Emissions Development Strategy to set national decarbonisation targets and actions including our transport sector. “We will be able to share with you what we are looking at in terms of transitioning our domestic transport.